To the left of the altar, Saint Joseph is depicted with the two turtledoves that he offered at the presentation of the child Jesus in the Temple (Lk. 2: 25). According to the Jewish Law (Lev. 5:7) the turtledoves are the offering of a poor man who cannot afford a sheep. 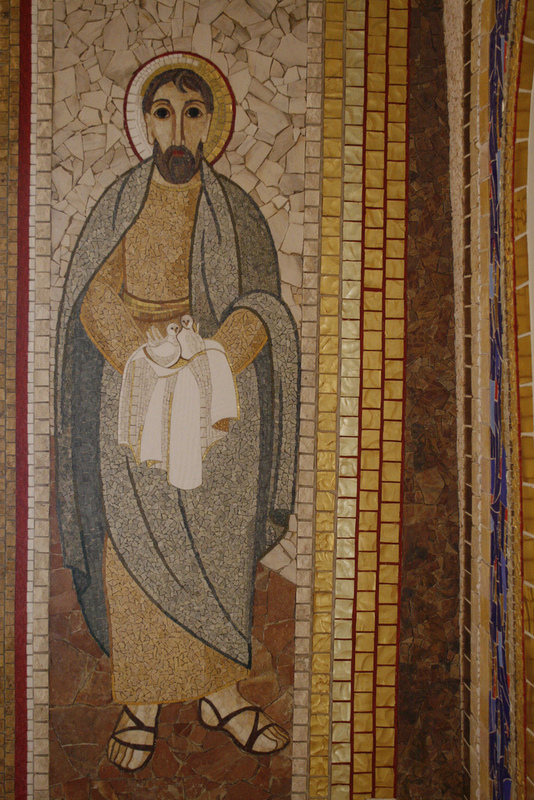 Placed close to the altar, Saint Joseph invites us to approach the liturgy in a spirit of justice and humility. Beside the ambo from which the Word of God is proclaimed, an angel holds a burning lamp: “your words are a light for my step and a lamp for my path” (Ps. 119: 105). May the proclamation of the Word enlighten our steps and show us the way to God the Father.